There are many e-commerce stores popping up right, left and center. The online market is like “Perfect Competition” described in economic studies; in perfect competition, there are no barriers toand exit and no single player can influence price. It is very easy to set-up an e-commerce store but with thin margins and cut-throat margins it is very difficult to survive and prosper in this segment. Many e-commerce stores are closing down, and yet at the same time, new big players like Walmart are entering into the market by purchasing websites like Jet.com in multi-dollar deals! Amazon is continuously expanding and is now currently pushing to capture a greater market share in India. The market has potential but only for the most determined. For the small players right now, it is especially a daunting challenge, as the market is in consolidation stage and most of the big players are combing and pushing slower businesses out or buying them out. So the point comes what can you do for success in the e-commerce world? You need to stay up-to-date with the latest trends in online advertising, for it may look easy but it is actually quite challenging. Thanks to the advent of traditional Google ads will no longer cut it. Also charging your credit card on Facebook is also quite the expensive option and you cannot just rely on Facebook alone. So what do you do? You keep abreast of latest trends, for example right now Video ads are one way of getting around ad blockers. Besides ad-blockers, video ads make more sense. Video consumption across devices has increased thanks to falling data charges in most countries and increasing smartphone and internet penetration. Right now the e-commerce market is cut-throat. You can only maximize margins to a certain level. To stay competitive against giants you need to cut every possible cost. You need to look inwards and see where you can save money. Find a cheaper toll-free number, a cheaper shipping service or find ways to save on packaging. Negotiate better credit periods and see your bank charges and negotiate for each and every cent you can. It is difficult but every cent saved helps to add towards the bottom line. This is especially a must for start-ups, often being helmed by fresh graduates who also have to worry about paying off their student loans. Every strive and profit you make out of your business not only helps you scale but also helps to get your personal finances in order avoid problems like delayed student loans. Customer satisfaction rates are often treated like a fire putting exercise. They often come into the limelight once sales start to fall. By then, restoring customer satisfaction and restoring goodwill lost becomes an uphill task. All businesses heavily rely on customer satisfaction thus one should keep a constant track it. Monitor your total sales and then draw up a meaningful sample that represents the whole population. Follow up with this sample and understand the customer satisfaction levels. Also keep a good track on customer reviews. Pacify disgruntled customers fast because they are the ones who are more active at commenting on public pages. Social Media has truly been a game changer in how businesses connect with their customers. What used to be a cumbersome and expensive activity has been made very easy, but at the same time it has also become a constant battle for customer attention. Social media has also helped the customers. It is much easier for them to connect with businesses. No longer do they have to rely on the traditional 1-800 number, enduring long hold times. They can simply post a question and then the business can answer them (within the same day hopefully). On the flip side, angry customers can post their scathing reviews for the world to see. Over all social media has really become a necessity for business if they want to stay valid in this world. And many businesses have been milking social media for all its worth, some even going as far as using it as a substitute for having a professional website. While social media is necessary for achieving success, especially for small businesses it can in no way substitute a business website. In order to truly milk social media, you have to pair it with a website. Why do you need a big website along an efficient social media presence? Recently Facebook added the sell feature on to pages, in short turning business pages into small business online stores. This feature again raised a slew of questions that why do we need a website anymore? You can even have a proper e-store running on a Facebook page. This question is especially asked by small businesses or start-ups who have limited budgets. Why should they put a strain on what are often shoe-string budgets to make a website, when they get almost the same level of functionality from a social media presence alone? 15 years back you could do without a website till you got to a level of financial success. However the market dynamics have considerably changed since then. Internet penetration in first world countries is especially at levels we had never nearly considered. And the speed at which the online world is expanding puts it a level where we can say that the virtual online world is one that exists in parallel of real one. It is that vast. So if your business does not have a concrete presence in the online world then you do not appear as a credible business. Before we go anywhere, we Google it. If I only get Facebook page results, that makes your business look like an amateur set-up and makes it lose its credibility. Just like it is expected for a store to have a billboard, consumers expect businesses to have their own websites, just for the sake of contact details and address if not anything else. Many years ago it used to be a shop front that served as the first impression of the establishment. Now it is the website that makes for the first impression. You need a good website to ensure you grab people’s interest and convert that interest into a sale. You can put up your products up for sale on Facebook, but that is just like putting your products on some other store’s shelves. You cannot influence the environment of the store to shape customer experience. Your products are the mercy of someone else. You cannot control customer shopping experience on Facebook. Facebook even changes the themes when and as they wish. But a website is somewhere you are in full control and give the customer a shopping experience you feel would be the best way to market yourself. For example some e-stores do not opt for a traditional slider and go the “Tinder” way that is the customers view one product at a time. 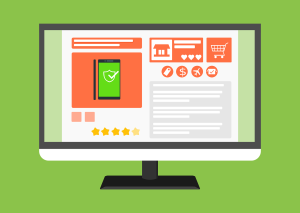 Also a basic feature that having your own website gives you is recommending customers their next possible purchase, based on their present viewing history. This is something that you lose your products on social media. Social media has also restrictions on photo sizes that you can upload. This may be a drawback as intricate details may be lost when you compress file size. Also many people might not want to buy from Facebook, so not having a website means lost sales. And a website along with a brick and mortar store is the perfect combo. Your brick and mortar store gives the customers who want to “feel and buy” what they want and online customers get the feasibility of buying from wherever at whatever time they want. Unlike Facebook you are in complete control. How your business works in completely on you. Just like Facebook gives you a free “shelf” to display your products, businesses with successful e-commerce website have gone on to sell “shelves” on their websites. A website has a huge potential for revenue making and is only limited by your imagination. A small business gains by investing in a website as they gain the option of multiple income streams from one smart investment! One last thing to mention is that it is very important you choose a professional company to do the development for you. This is because you might require after-sales services, and freelancers are not that reliable. What is the Internet of Things (IoT)? The Internet of Things (IoT) is a hot topic these days. Unlike many overhyped technology visions over the years, IoT has the underpinnings today to start happening throughout the developed world. Sensors everywhere. Ubiquitous mobile wireless communications. Powerful data analytics. Graphic visualization tools. Although the Internet of Things (IoT) often refers to connected devices in a personal or industrial setting, it also has the potential to unlock vast opportunities in many cities today, from energy management in civic buildings to traffic monitoring to public services. But that wealth of possibilities can be overwhelming to local governments, as public agencies try to find ways to get started with IoT while making the most of limited resources. The CityNext blog has some advice from guest blogger Melissa Topp of Microsoft partner ICONICS: Don’t try to do it all at once. Instead, pick one thing and spend time getting it right before expanding your Cloud IOT program. So Pick Your Best Bet And Get Started on IoT! ICONICS works with Microsoft to deliver cutting-edge tools for infrastructure, mobility and analytics, on a Microsoft Azure cloud platform that reduces capital investment and dramatically expands data storage and processing capabilities. In her post, Topp explains how a recent smart energy management project for Peirce Elementary School in Arlington, Mass., illustrates the keys to success for cities’ IoT Cloud deployments. By starting with a single project — in this case, cutting summer operating costs in a school building — then focusing on that problem until they had it right, and finally expanding their program in phases, the school’s administrators were able to discover and resolve equipment problems and lower energy costs. Topp’s experience is a good reminder to businesses in any industry that IoT deployments don’t have to be massive and overwhelming to make an impact. Want To learn More About How Microsoft IoT Helps Cities and Businesses? Here’s a link to understand how this can happen and while you are taking a look at this consider how, when a city changes how it does things, how does that affect the experience of the customer of that city? It’s huge! IoT Can Be Daunting for City Governments. After all, with just one of Google’s self-driving cars gathering 750 MB of sensor data every second of driving time, the amount of data that a fully wired city would generate in a second would have to be in the petabytes. What’s more, cities would have to figure out where to put all that data. It’d be a bigger problem than Boston had finding places to put all its snow during last winter’s relentless blizzards! But it doesn’t have to be daunting. How do you eat an elephant? One bite at a time. Think of IoT as the same thing. Don’t try to do everything. Just pick one aspect of your business where it will have a real impact to revenue generation, cost savings, and the customer experience. Wired (IoT) Cities Drive Better Experiences. Nonetheless, cities around the world are “wiring up,” as the many Microsoft CityNext customer stories can attest. Among those cities are also many ICONICS customers. They’re successfully transforming themselves through greater operational visibility and efficiencies using our HMI/SCADA, mobility, and analytics tools for cutting-edge energy and sustainability solutions. In working with hundreds of cities worldwide, we’ve found that their successful deployments typically have three common hallmarks that we might call “secrets” of their success. First, they chose one place to start, many with a specific need in their municipal utilities, water treatment facilities, transportation systems, or schools. Second, they focused their limited resources and energies on that starting point to ensure it worked, taking as many lessons as they could from it. Third, they didn’t try to solve everything at once, but rolled out their deployments in phases. What is An Example of a City That Has Gone Down The IoT Path? Arlington, Massachusetts, a town of 43,000 people six miles northwest of Boston, started with the need of its public schools to consolidate summer operations into one building, Peirce Elementary School. To help save air-conditioning costs, the district bought a new chiller, but it also sought energy management software. After evaluating competitors’ offerings, it chose ICONICS Facility AnalytiX hosted on the Microsoft Azure cloud platform. Using Azure eliminated the need for any upfront capital expenditures in IT infrastructure. Facility AnalytiX uses advanced Fault Detection and Diagnostics (FDD) technology. FDD works via customizable fault rules that weigh the probability of equipment failure. It then alerts staff to actions they can take when faults occur. IoT Focus Helps Save Time and Money. When equipment fails, the software analyzes current and historical information (along with symptom/cause relationships), executes predictive algorithms, and provides a list of possible causes sorted by probability. This information is securely available to all key stakeholders from desktops, browsers and smart devices such as Microsoft Surface tablets. FDD helped the district cut the time its HVAC contractors spend searching for malfunctions by as much as 20 percent. The Facility AnalytiX software also showed that the chiller was unnecessarily turning itself on and off every five minutes. This cost the district energy and would potentially reduce the chiller’s lifespan, as constant cycling would put more wear on the equipment. The software helped the district save 20 percent of its energy consumption the first winter after installation. When You Implement IoT, Phase it in With Fast, Easy Cloud Scalability. With the success of Arlington’s deployment of smart energy-management software in that single elementary school, the town is already working to adopt it to another school. And government buildings are likely candidates for additional deployments. In other words, it found one place to start; focused its resources on making it work; and is taking a phased approach. With Microsoft Azure, adding those buildings to Arlington’s Facility AnalytiX operations dashboard is fast, easy, and economical. That’s because, by simply connecting to existing HVAC equipment, sensors, and SCADA network hookups, Azure can spin up another instance of Facility AnalytiX with just a series of mouse clicks. Arlington is just one of many examples from the ICONICS customer base of a city that is implementing IoT — sometimes without actually realizing it — to improve operational visibility and lower costs. As the town adds more buildings to its smart-energy network, those benefits will continue to grow. With Microsoft Azure, it won’t need to add any IT infrastructure that requires money, maintenance, repairs, and upgrades. In effect, Microsoft Azure is a standby IT resource for Arlington, just waiting to be tapped whenever new demands arise. Want to Learn More About Cities, Clouds and IoT? For more ICONICS IoT customer stories or to learn more about ICONICS products and solutions, visit www.iconics.com/IoT. Learn more about ICONICS’ smart city solutions on Twitter. Follow Microsoft CityNext on Twitter for news, trends, and smart city solutions. The Big Data bug has Just About Bit Everyone. Salesforce announced their Analytics Cloud ecosystem will include: Google, Cloudera, Hortonworks, New Relic, Informatica and Trifacta. It’s true there is more data that ever before. But the k ey with data is to not let it turn into a data lake. It’s great that Salesforce recognizes the need to beef up their analytics could, but the data still needs to go from data to actionable, real-time, right-time in-jounery customer experiences to provide the data employees (think call center agents or sales people or marketers) need to create amazing experiences. Salesforce’s Analytics Cloud is Powered by the Wave Platform, and will bring together a dynamic user experience, indexed search and a powerful computing engine to explore any data source. Designed from the ground up to be open, more than 80 partners have now joined the Analytics Cloud ecosystem to extend analytics for every conceivable use case and enable data-driven companies to connect with customers in a whole new way. That’s a lot of partners and a lot of APIs. Is the Tech Landscape Becoming Too Complicated? My fear for business users is that the landscape of technology is becoming so complex – with thousands of choices for varying needs, that business users will get lost in the mirage of chooses. (Maybe that’s where being friendly with IT will help.) If the businesses users do get overwhelmed, they will likely get halted in choosing something. That’s never good for software vendors when that happens, as it makes for long sales cycles or comments like, “Hhhmmm looks interesting, we’ll get back to you.” That is usually a polite way of saying no. Or at least “no” for now and for a while. ● Google offers a set of cloud big data services to ingest, process, store and analyze billions of rows and quickly run advanced queries without having to manage any infrastructure. Using Salesforce Wave for Big Data, a marketing manager can analyze the correlations between customer profiles in Salesforce and actual customer engagement data from the Google Cloud Platform—such as purchases, clickstream and mobile app usage—to optimize marketing spend and increase customer acquisition. ● Cloudera enables companies to deploy an enterprise data hub, a secure analytics platform powered by Apache Hadoop, to store, process and analyze any data type at scale. Now a marketing executive will be able to identify patterns between a product usage log from Cloudera alongside CRM demographics to target the right customers for a loyalty campaign. ● Hortonworks provides an enterprise-grade data management platform based on 100 percent Apache Core that enables companies to use the power of Hadoop-drive analytics to optimize the performance of Hadoop cluster. Now a retail bank associate can explore massive amounts of operational, transactional and balance data to understand local economic trends to provide better banking services and counsel to each customer. ● New Relic delivers a software analytics platform that provides real-time insights on the performance of a company’s Web and mobile apps. As a result, companies can better understand how customers are engaging with their digital brand, including clickstreams, mobile activity, end-user experiences and transactions. Now correlations between customers’ behavior on a retail mobile app and history of customer purchases can be visualized together to enable a sales rep to improve cross-selling strategies. My POV: The EMC Digital Universe study*, “The Digital Universe of Opportunities: Rich Data and the Increasing Value of the Internet of Things,” the digital universe is doubling in size every two years and will multiply 10-fold between 2013 and 2020 – from 4.4 trillion gigabytes to 44 trillion gigabytes. That’s a lot of data. And while it is true, the large amount of data is the OPPORTUNITY for companies to reinvent themselves through data analytics, the question is will they? While legacy analytics software was never designed to manage the volume, variety or velocity of big data, I don’t think that was the only issue why companies didn’t change the customer experience. @Drnatalie VP and Principal Analyst, Covering Marketing, Sales and Service to Make Amazing Experiences. The GreenPeace Report puts technology companies into groups of energy use: Dirty Energy, Middle Of The Road and Green Innovators. As an analyst, we talk a lot about the newest types of software, computers and gadgets of which need energy to run. And there is real resurgence of entrepreneurial spirit, where people are looking to feel satisfaction from the work they do and make the world a better place, rather than just tolerating brain-numbing work for the sake a of paycheck, only to find enjoy somewhere else. With all the enthusiasm also comes a great deal of energy use that we may or may not be aware of. According to the Kaufman Index of Entrepreneurial Activity (KIEA), the entrepreneurial rate in the U.S. is already well above the dot.com bubble of 15 years ago. From social media to music, streaming video, email and commerce, we are increasingly moving much of our lives online. 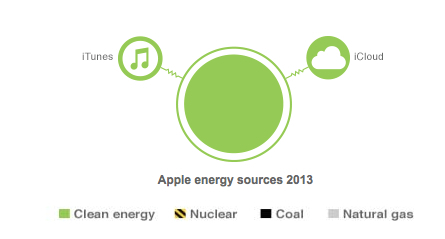 But which companies are storing all of that data, and how are they getting the energy? Here’s who hosts some of the internet’s most popular sites and services in their data centers – and whether those companies are using dirty or clean energy. Find out how you can participate by following the hashtags #clickclean and download the full report and take action for a green internet. Three Types of Energy As the expansion of technology is continuously accelerating, we are also creating a world where more and more energy is be required. There’s a term called Dirty Energy, which means the focus is only on efficiency and the company has taken few or no steps to switch to renewables. And the there’s the Middle of the Road, which are the companies that are taking steps toward a greener internet, buy not leading the way. 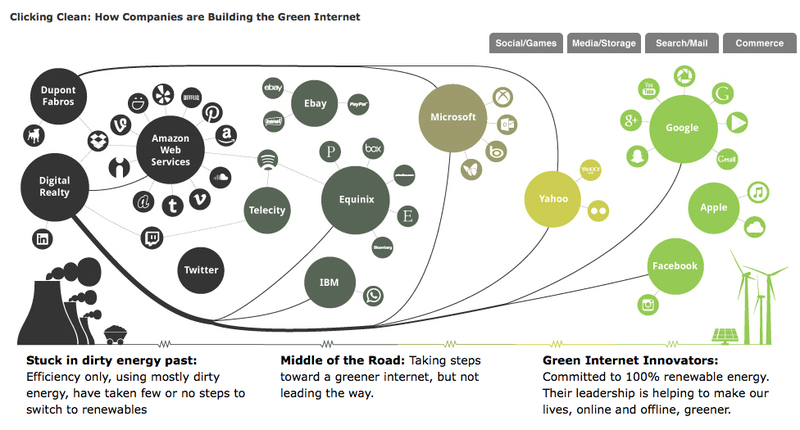 And then Green Internet Innovators are the groups that are committed to 100% renewable energy. Their leadership is helping to make our lives, online and offline, greener. 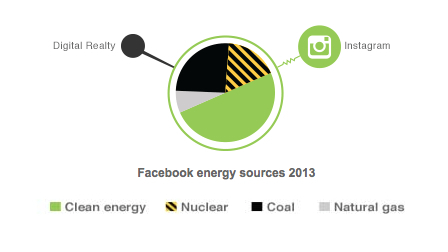 How Facebook Uses Energy Facebook continues to grow and dominate the global social media landscape with 1.23 billion monthly active users. Facebook has made huge strides forward since 2012 to become one of the clear green internet leaders. Radical improvements in transparency and efforts to deliver significant wind energy investment in Iowa have helped drive Facebook into the top tier of companies creating the green internet. By building on the advocacy it has started with energy utilities to drive more clean energy investment, and continuing to find ways to bring renewable energy to scale to power its data centers in North Carolina and Iowa, Facebook is setting a clear bar for other major social media networks and internet companies to follow. 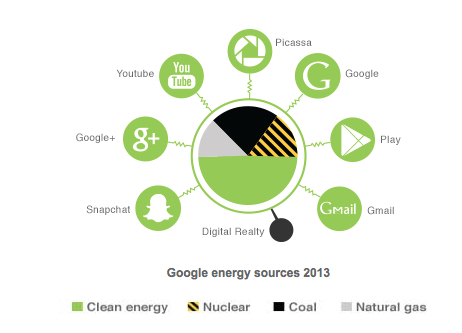 How Google Uses Energy Google has continued to lead the major internet brands in purchasing renewable energy at scale to power its massive online ecosystem. The company is now reporting electricity consumption of 3,315 GWh, with 34% of its operations powered by clean energy. Google’s use of power purchase agreements to procure clean energy has been adopted by others in the sector, like Microsoft, and it has successfully influenced utilities in Oklahoma and North Carolina to offer new renewable energy options by using its immense business clout. As Google expands its footprint to Latin America and Asia, it will need to maintain its innovative edge to make sure that it continues to source clean energy even in countries that feature dirty electric grids. 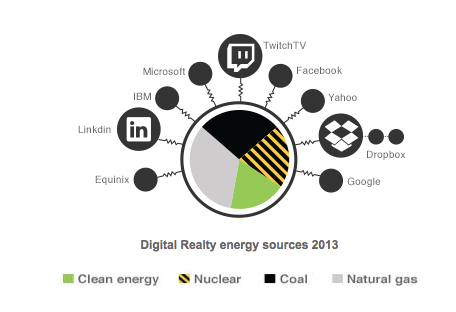 Twitter falls between the types of companies that are clearly innovating in their use of energy sources and those that fall into the dirty energy collection. Twitter’s has changed the way people around the world communicate. Twitter does not yet own any data centers of its own, instead renting data center space from others. The microblogging platform has remained silent about the type and amount of electricity that is powering those data centers. 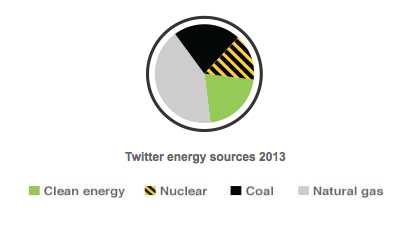 Twitter remains at the bottom of the industry for energy transparency, disclosing no information about its energy footprint. Twitter lags behind its competitors in social media, Facebook, which took significant steps to increase transparency and increase its use of clean energy soon after it went public. And on the side of the spectrum are copies that fall into the Stuck in dirty energy past ways of providing and using energy. One example is Digital Realty Trust (DRT) which is the largest digital landlord in the world, with 131 data centers worldwide, roughly three-fourths of which are located in the US. Digital Realty operates on the wholesale end of the colocation spectrum, providing both entire data center properties to large customers like Equinix and Amazon Web Services, and also renting portions of facilities to meet the needs of large online properties such as Facebook, Rackspace, Salesforce, Google, Microsoft and Yahoo. So the question really is – as we build all this technology, are we really making the world a better place? We need / want technology to scale. But at what cost? CEO’s need to consider not only their new innovations in products and services, but also how they are leaving the environment. Are they leaving it in a better or worse state and at the end of the day, what’s the cost in the long run to these decisions.